SSD Reliability: Can You Really Rely on Your SSD? Home Blog Tips & Tricks Memory SSD Reliability: Is Your SSD Less Reliable Than A Hard Drive? Solid State Drives, or SSDs, are faster than regular spinning mechanical hard drives, HDDs. But just how reliable are they when it comes to long-term use? How much usage you can expect to get out of an SSD, and how many years should that add up to? If you’re going to be using a SSD, then there are a few useful metrics that help measure SSD reliability that are worth knowing about, like P/E cycles, TBW (Terabytes Written), and MTBF (Mean Time Between Failures). If you pry open an SSD, you’ll see that it’s no different than a Flash drive. You have some memory chips on a circuit board and an input/output port that usually comes in the form of PCIe or SATA, which is what’s responsible for feeding power and transferring data. Unlike in a traditional hard drive (HDD), this doesn’t have an actuator arm to read and write data. Since you’re not dependent on the physical arm’s movement speed, SSDs can read and write data much faster. It’s hard to say the exact difference, since there are different types of SSD form factors and NAND cell types-- mentioned below-- but SSDs are several times faster. The lack of an actuator arm also means SSDs make no noise, unlike HDDs. We won’t get too much into the differences between HDD and SSD, but one last major factor that almost everyone must consider when getting an SSD is that it is much more expensive per GB of storage capacity ($0.25 per GB for SSDs compared to $0.02 for HDDs). Almost all types of SSDs today are stored in NAND flash memory cells. Unlike most computer part names, NAND isn’t an acronym, rather, it’s a name that’s derived from its logic gate called “NOT AND”. The other part of NAND flash-- flash-- is a non-volatile solid state memory that retains data even when you remove the power source. However, flash type memory cells can only be programmed and erased to a certain number of times, which is measured in P/E cycles (which stands for programmed and erased). The number of P/E cycles a SSD is good for depends on the technology it uses and varies between 500 to 100,000 P/E cycles. The 2.5” SSDs are the most popular and the most affordable. On the outside, it resembles a traditional 3.5” HDD-- but its smaller, obviously. It’s light since it doesn’t have moving parts inside and will need a SATA connector for power and data transfers. It also has sequential writes and reads that can range from 325 MB/s up to 600 MB/s, respectively. This may look small compared to the PCIe SSDs below but this is more than enough to give the user a snappy experience. mSATA (Mini-SATA) SSDs are small, hence the name, “Mini”-SATA SSDs. It’s smaller than the 2.5” drives and is primarily used for smaller computers such as netbooks, laptops, small PCs. These are basically just as fast as the 2.5” SSDs since they (mostly) share the same specs; they just differ in size. M.2 SSDs, like mSATA drives, are bare circuit boards, but they do have a variety of width and length combinations. This makes it more flexible than mSATA and ideal for ultrabooks and tablets. 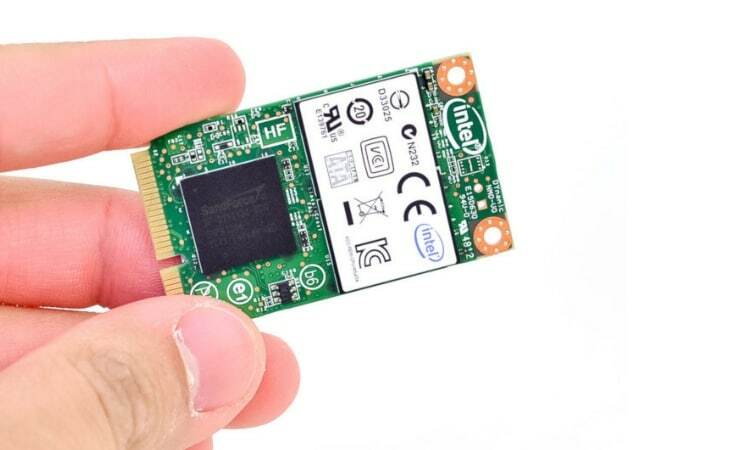 They also support NVMe (non-volatile memory express), a host controller interface and storage protocol that boosts the transfer rate of data between the system and the SSD. 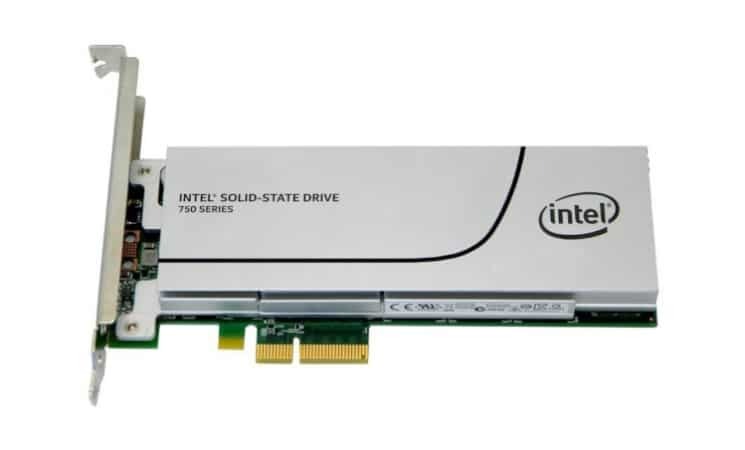 Just in case you phased out when we said “host controller interface and storage protocol”, we’ll wait… it means that these SSDs are faster at processing data just like PCI-E SSDs, which we’ll talk about next. PCI-E SSDs offer the best performance, but are also the most expensive. They use the PCI-E slots as their interface. While PCI-E lanes are fast, SSDs will be limited by the lane you choose, so try to use the fastest available slot, at least a x8 slot. Refer to your motherboard’s manual to figure out the speed of each of your PCI-E slots. Regardless, PCI-E SSDs and m.2 SSDs let you experience up to 4x faster than regular SSDs. For these SSDs, Sequential Reads and Writes can range from 2,500 MB/s (read) and up to 1,300 MB/s (write), respectively. Moreover, these things can also have over 500MB of DDR3 high-speed cache. 3D NAND was originally developed by Intel and Micron. 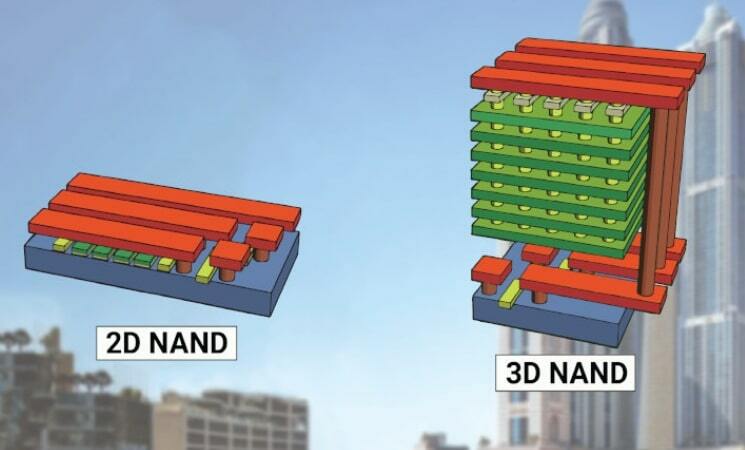 This type of NAND stacks 32 layers of memory cells while V-NAND or vertical-NAND stacks 48 layers of memory cells. These new technological advancements have an increased the capacity of drives without altering production costs all while cutting the power consumption in half and increasing the longevity of planar NAND at the same time. “Do SSD drives fail?” Well, that’s actually redundant since the D stands for drives, but yes. Of course. Everything fails. Rather we should be asking: “Do SSD drives fail faster?” That is a bit more complicated though. SSDs are more reliable when it comes to harsh environments than HDDs because they don’t have actuator arms or any moving parts. As such, SSDs can withstand accidental drops and extreme temperatures better than HDDs. It’s also worth noting that when these are seen on packaging, these are being used as a guarantee (part of the equation uses the warranty, after all). As such, they are usually higher than what you’d expect to use, but also often lower than what you could push the SSD to. Think about it like a tire, it may only be guaranteed to not explode while driving down the freeway for 5 years, or 50,000 miles, but it may last way longer. The first several of these are relatively straight forward and are even interchangeable using some math. For instance, TBW is a reference to the number of terabytes you can write over the lifetime of the SSD. In many cases, the TBW is actually pretty ludacris and is a number you’ll never come close to hitting; you’d be much more likely to have it fail from old age. The name sort of says it all. This is a measure of how many Gigabytes per day you are saving/overwriting. Since most SSDs are built with the idea that you are going to be using several Gigabytes per day-- which isn’t going to happen unless your computer is a work station-- you should be fine. This is pretty simple as well, although the name is somewhat misleading. You would think this is a measure of how many times you can write data in a day, but it is actually how many times you can rewrite the whole SSD per day. 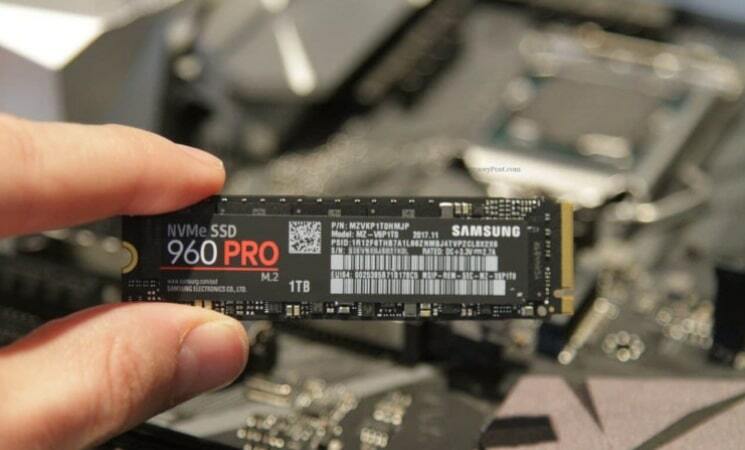 Let’s look at the Samsung SSD 850 Pro SATA with a 10 year warranty that has a capacity of 128GB, 256GB, 512GB, and up to 1TB. This is designed to handle 150 terabytes written, or 150 TBW. But according to Samsung, these SSDs can withstand up to 600 TBW. Now, if we’re going to do the math and calculate the endurance of this SSD over the course of 10 years, this drive can read and write 40 GB of data a day. Reflecting this to a real-life situation, where a normal office user writes between 10 GB to 35 GB a day, the warranty would have expired by the time you reach the 150 TBW limit. If we take the TBW, we can use equations (or an online tool) to find out both the DWPD (.041) and the GB/d (41). SSD vs HDD reliability rate is defined by MTBF, or Mean Time Between Failures. This is one of the more tricky, and less obvious reliability measurements. It’s important that you understand MTBF and solid state drive failure rates before making any type of purchases. 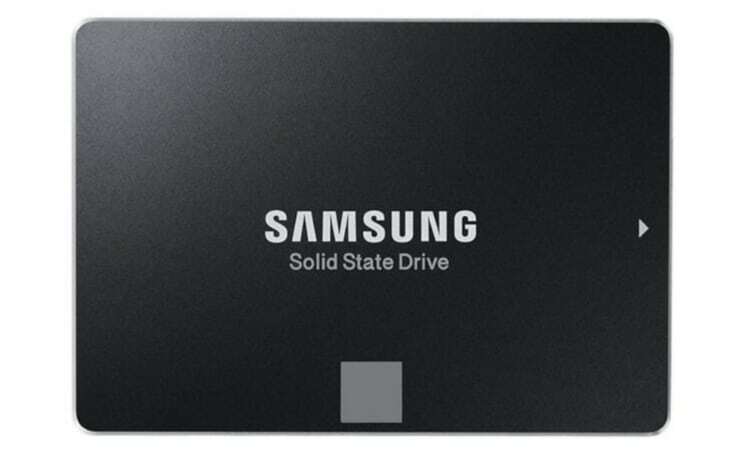 Let’s take an Intel® SSD 335 Series (240GB, 2.5in SATA 6Gb/s, 20nm, MLC) and SAMSUNG 830 Series 2.5" 256GB SATA III MLC. The Intel SSD has an MTBF spec of 1.2 million hours while the Samsung SSD has an MTBF spec of 1.5 million hours. But this doesn’t mean that because Samsung has more hours that it will last longer-- MTBF doesn’t work that way. As you can see, MTBF refers to the failure rate of a drive over its expected lifetime. This doesn’t mean a 1.2 million hour MTBF drive will last 1.2 million hours, and a 1.5 million hours MTBF drive will last 1.5 million hours (that’s 136 to 171 years by the way). 8,000 cumulative hours per day * 150 days = 1.2 million cumulative hours before one failure occurred. The Samsung 830 is expected to have one failure every 187.5 days. However, not all drives are tested to the same standards. For HDDs, instead of using MTBF as a unit to index errors they use AFR or Annual Failure Rate to measure the reliability rate of HDDs. The average AFR of HDDs range between .55% and .90%. However, this number is misleading since HDD manufacturers don’t necessarily specify how they failed. It could be anything from overheating to accidental drops, or even natural disasters. When it comes to failed disk drives-- ie, just the ones that failed during normal operations-- the rates range from 0.5% to as high as 13.5%. So What Does SSD MTBF Mean for Me? Unfortunately, it’s hard to find SSD failure rate by brand; in most cases, we merely have TBW, and other company given metrics, to go by. When it comes down to it, most consumers should find any MTBF over 1 million hours to be acceptable. This generally indicates about 3 failures a year across 1,000 drives that are used 8 hours a day. In other words, you’d have a 0.3% chance of having a write operation failure within the drive’s warranty, assuming you are using your SSD for 8 hours a day. In other words, if we’re looking at SSD reliability vs HDD reliability, solid state drive failure rates-- while not apples to apples-- are not incredibly different from those of HDDs. Is There A Way for Me to Check My SSD’s Lifespan? Each of these software have their own way of checking your SSD lifespan but they are straightforward and pretty much the same. It should also be noted that the software works no matter what SSD brand you have. So if you have an Intel SSD, you can use Samsung Magician without any worries. Is an SSD Ideal for You? It’s undeniable that replacing your spinning HDD with an SSD is worth it. They make your computer boot faster and make programs more responsive. If you really need that speed boost for productivity or faster loading times in games, then an SSD will definitely be worth it. SSDs are impervious to being bumped around, they consume less power, and take up less space making them perfect for laptops. Note: It’s worth noting that you will need an SSD with a larger storage capacity than your HDD if you wish to transfer or clone your files from your HDD to SSD. If that’s the case, you’re likely going to pay a hefty amount since SSDs are so much more expensive per GB. If you’re interested in seeing which SSDs are the best on the market, then check out our roundup on the best SSD for gaming. Head over to our best gaming hard drives article if you want to invest in the right mechanical hard drive to use in an SSD/HDD setup. Getting an SSD will make a significant difference in how your system responds and how fast it boots. You’ll likely go from 30 seconds to a minute before the system boots with an HDD to 8 seconds or less. You will also notice that files load much faster and that noise is… well, non-existent. When it comes to SSD reliability, it depends on how often you use the SSD and how many P/E cycles it has along with its respective MTBF or Mean Time Between Failures spec. But personally, I’d say getting an SSD will always be worth your investment. After all, time is money and cliches are truisms.